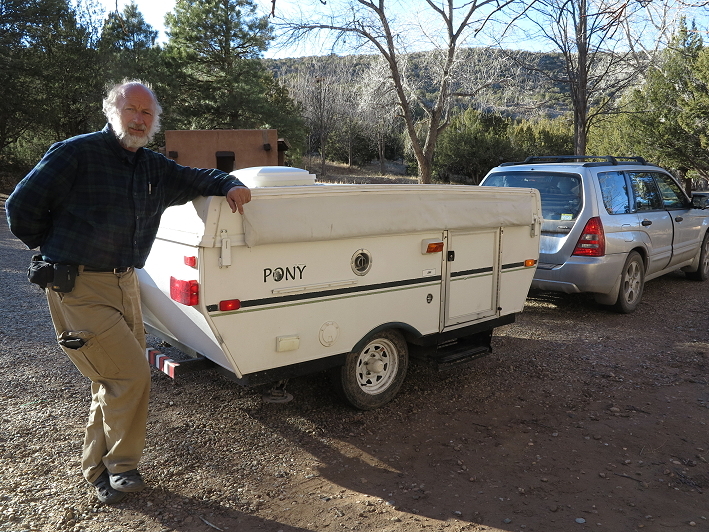 With a four-day weekend ahead of us, I get up early enough to have a quiet cup of tea before I start packing for our Pony (pop-up tent trailer) trip to Villanueva State Park, about an hour’s drive to the east of us. Looks like the snow that was forecast has gone somewhere else for the weekend, leaving us with just a chilly breeze, but hey, it is mid-February, and we are going camping. I have most everything ready by the time Clifford gets up and then it is just a matter of breakfast, dishes, and the other last-minute things before we head out. We make a little detour to the Eldorado market for bread, wine, cheese, and a hot roasted chicken for lunch. After a easy trip down the freeway to Ribera, we follow a state highway that winds its way through the countryside and through several little villages, all of which appear to be suffering from lack of resources. 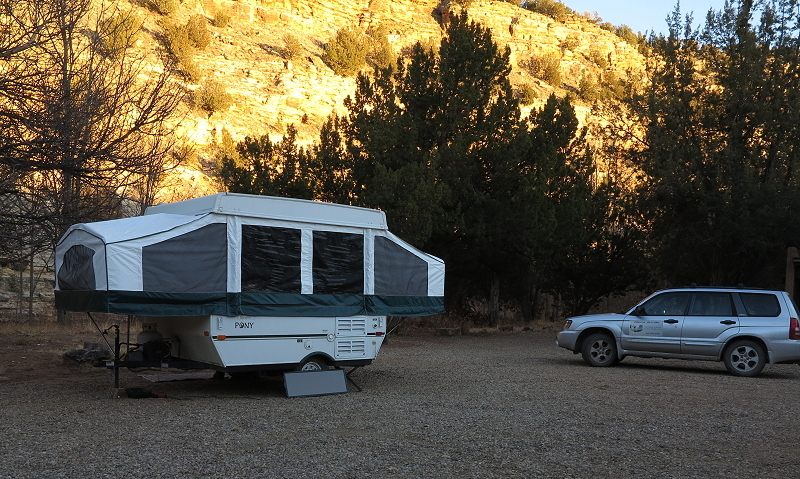 About 12 miles in, we arrive at the Villanueva State Park, a well-kept campground along the Pecos River with trees all around and mesas flanking both sides of the river valley. 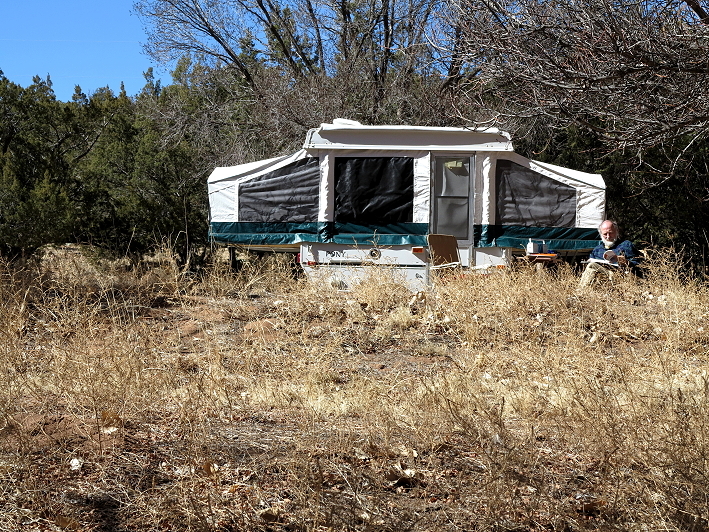 We find a nice site where we can park in the sun, sit in the shade, and see the Pecos River from our front door. We get set up and enjoy our now not-so-hot chicken. This weekend we get to try out our little solar panel for the first time. We are hoping to keep laptops charged and have lights to read and write by in the evenings. 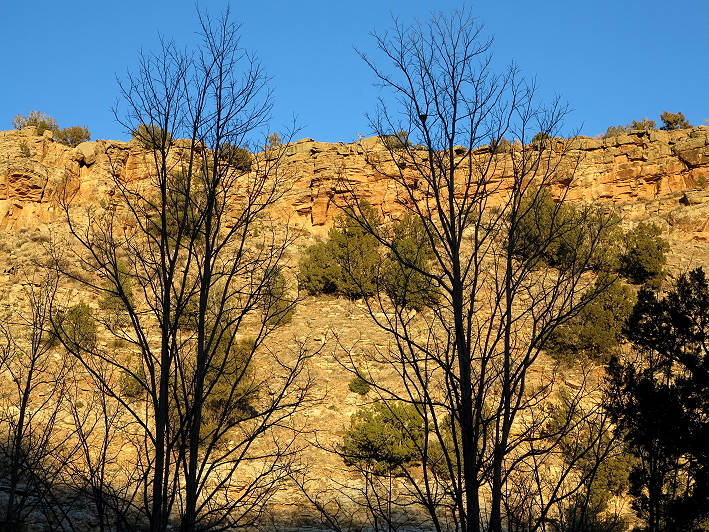 We have hot tea, admire the view, especially the mesa, golden in the light of the setting sun. In the evening I write in my journal and Clifford studies. After darkness covers the campground, we have dinner and soon it is time to head to bed. Saturday morning I wake with the light and get out of our warm bed, surprised at how chilly it is. Taking a look at the min/max thermometer, I see that it is 16 degrees outside and 24 degrees inside. 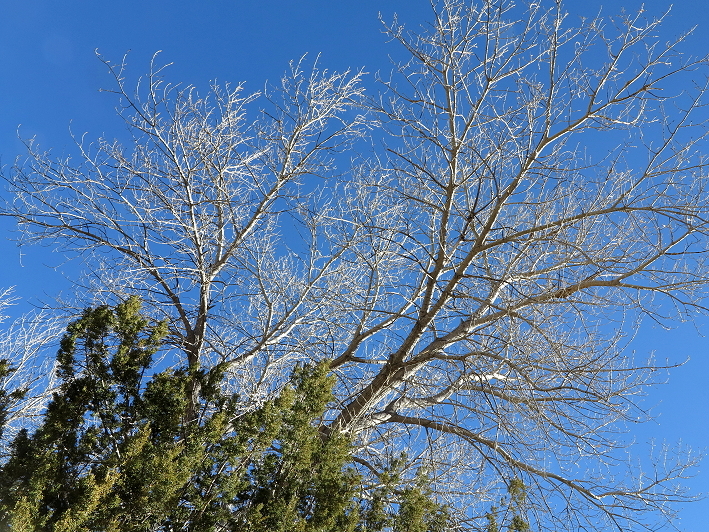 Brrrr…… I turn on both burners of the stove and dress warmly before heading down to the outhouse. Once back at the Pony, I debate with myself about having a campfire; I mean, 16 degrees is a bit chilly, but I want to be outside. I make a hot cup of tea and decide ‘yes’ to the campfire. I have been carrying a bag of little twigs and several pieces of firewood in the back of my car all winter just waiting for a chance to have a campfire while on an outing. Soon the campfire warms the air. The breeze is variable, which means the smoke blows my direction no matter where I sit or stand, making it hard to get set up to write in my journal. I put journal writing aside and just watch the dancing flames, moving from one spot to another, adding a little more wood to the fire now and then, enjoying its warmth and the hot tea. Once the sunshine reaches us, things change quickly. By the time breakfast is ready, it is warm enough that we sit outside to eat. 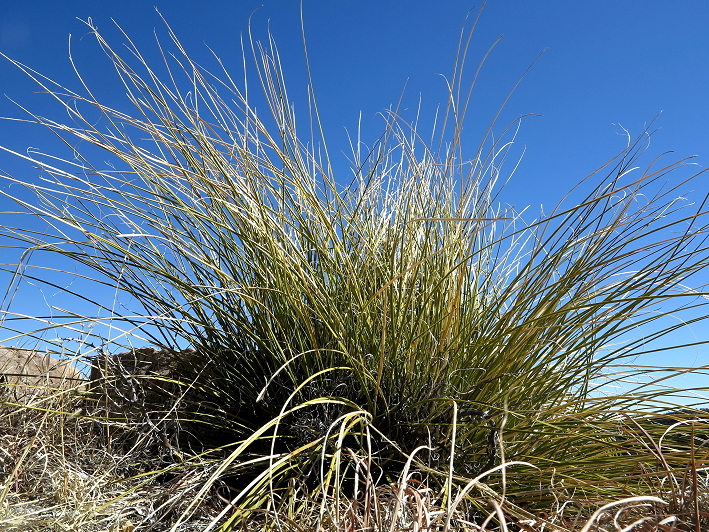 The sky is a beautiful blue and we are ever so grateful to be here with the river, the mesas, the trees, the breeze, and the blue sky. 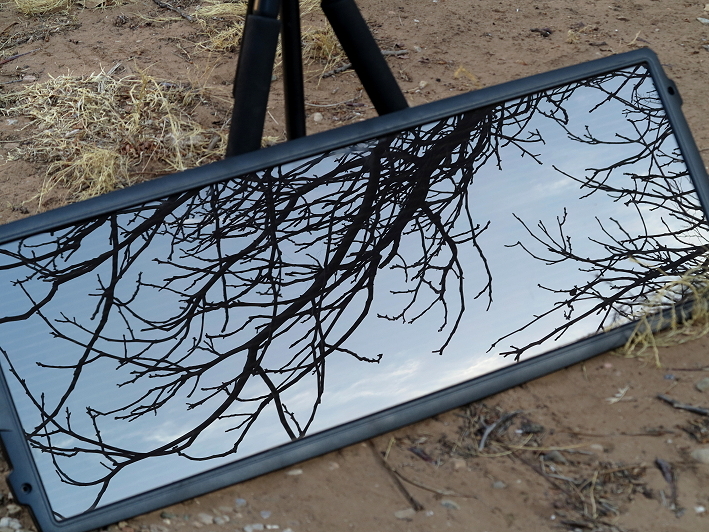 We have a plan to get some footage of the Pecos River for the next video we are making to feature Ang’s (my daughter) writing on You Tube. 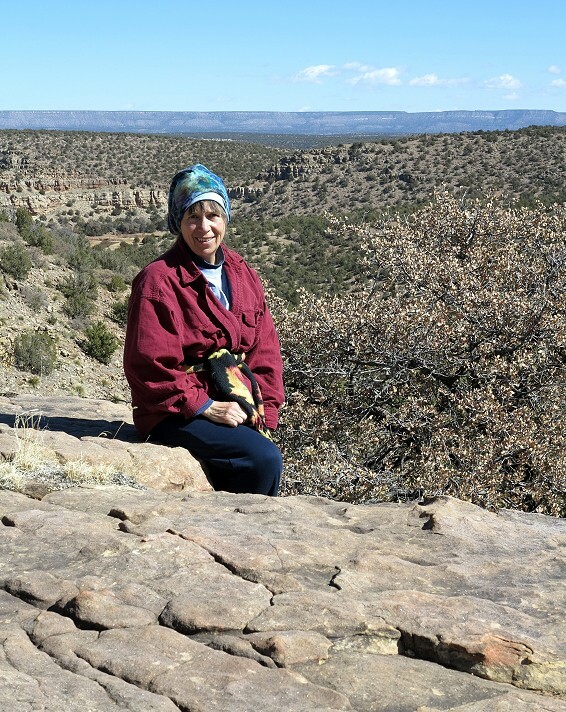 Her short story is entitled “Old River Woman” which is about the Sun River in Montana. 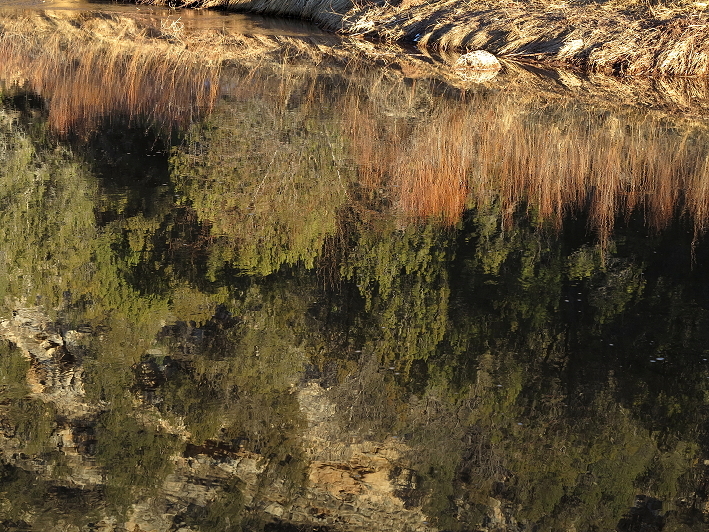 I have photos of the Sun River, but since we are not in Montana, video of the Pecos River, which is smaller but with similarities to the Sun River, can provide the visual as well as the sounds of a flowing river. I have the idea that I can wade a ways into the river so as to appear to be the Old River Woman as she is walking out into the river. 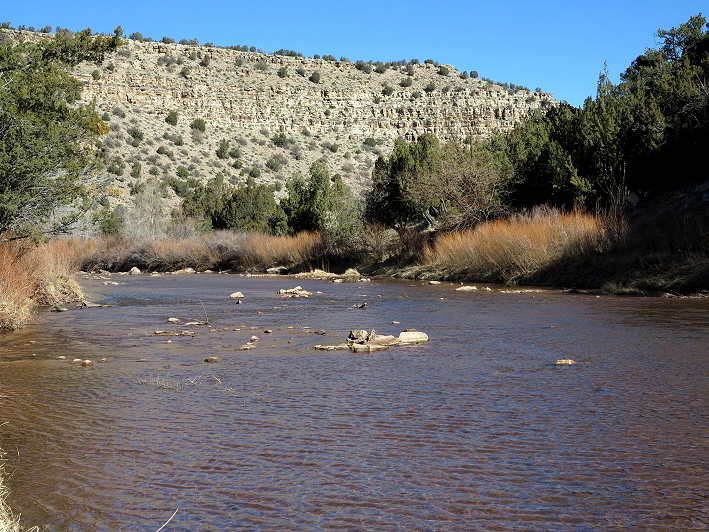 Well, the Pecos River flows right out of the Sangre de Christo Mountains where there is snow, and remember, it is mid-February even down here in the valley. I wade out several times, only shin-deep, into the painfully cold water. But the vision I have of how this will look is not the way that Clifford videos it. In the end, it is a little adventure, but not a successful video shoot of the Old River Woman. Getting back to the Pony, dry warm socks are very welcome. After lunch, I spend the rest of the afternoon editing “Opened Gates,” the third book of the second trilogy of the Novels of Shannon, written by Ang. This is a music theory weekend for Clifford; the chemistry and biology books and even the art supplies stayed home. The evening passes quickly and soon we head to bed. Sunday: I get up about the same time as yesterday and it is not nearly so cold this morning, but windy. 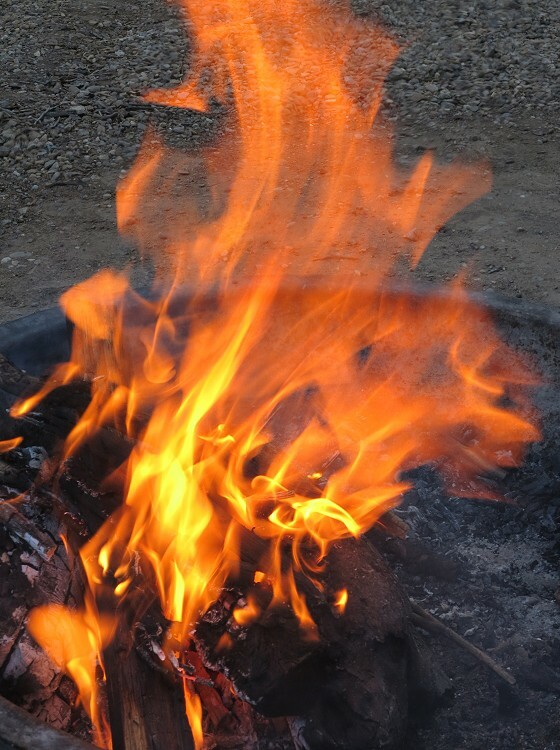 I decide to have a campfire, anyway, and as I sit and stand and walk around to avoid the ever-changing direction of the smoke, taking numerous photos of the flames, the thought occurs to me that taking photos of a campfire is a life lesson. Although I choose the paper and wood, apply the match, and push the button on the camera, I cannot control the movement of the flames and there is an infinite variety to how the photo will turn out. Even when the fire is providing ample opportunities for an interesting photo, if I am not focused correctly, the results will not be great. That is not to say that one must hang onto a certain focus – not at all; change focus, change vantage points, change field of view, experiment, but do it with a mindfulness that brings out the best in any given situation. And be willing to sit back and enjoy the campfire, knowing that flames are constantly in flux and so is life. Today, even though it is warmer, we eat breakfast inside because of the breeze. I do some editing of Opened Gates before we go for a hike. 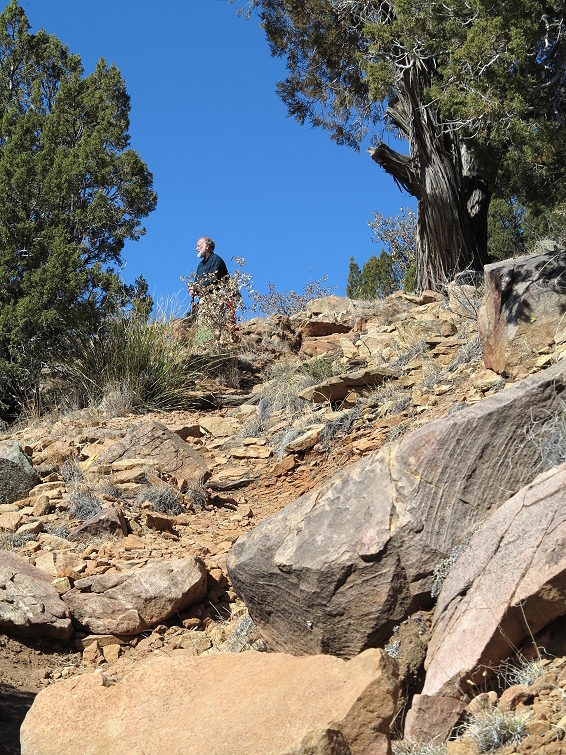 Today we hike up to the overlook on the mesa to the east. One interesting spot along the trail is the stone enclosure for the sheep or goats of the people who lived here in times past. 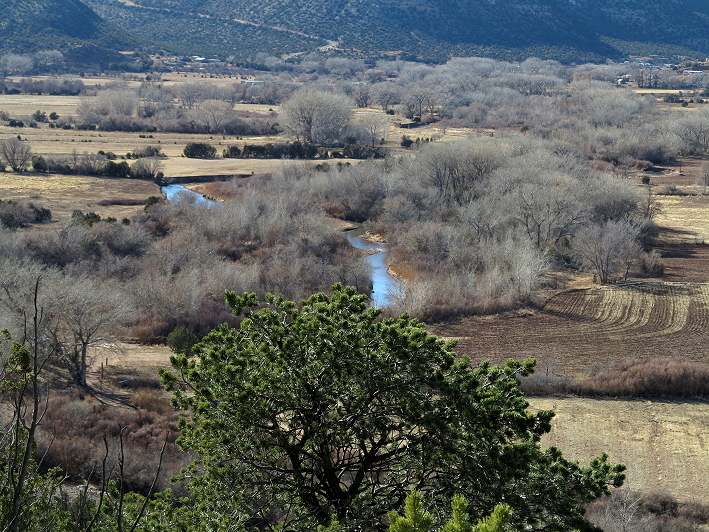 Instead of hiking the loop, the trail along the top of the mesa overlooking the river and campground below, which we have done several times, we go exploring the opposite direction, following a wide path that may have been a road at one time. 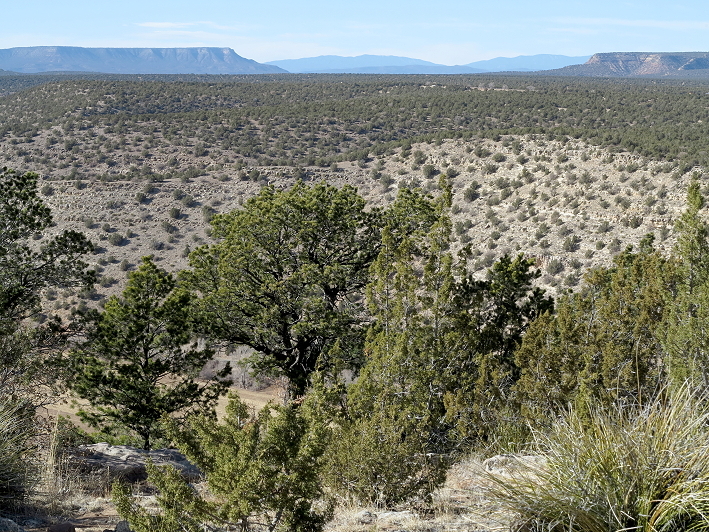 Juniper, yucca, and dull reddish rocks dominate the landscape. 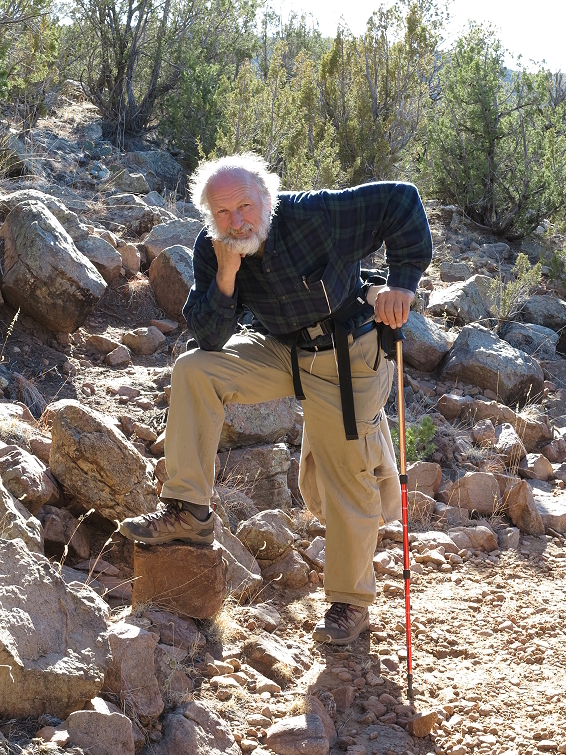 When we return to the shelter, we have cheese and crackers for a snack before heading back down the trail. Since I stop to take photos so often, Clifford gets ahead and then waits for me. After lunch, I continue editing while Clifford keeps on with music theory. Before we know it, the daylight fades, dinner is done, and we head to our comfy bed for a good sleep. Come Monday morning, our time is more limited, so I forego the campfire. I make tea and write in my journal at the table until Clifford gets up. After breakfast we work on our projects, editing and music theory, for a bit and then head out for another hike. 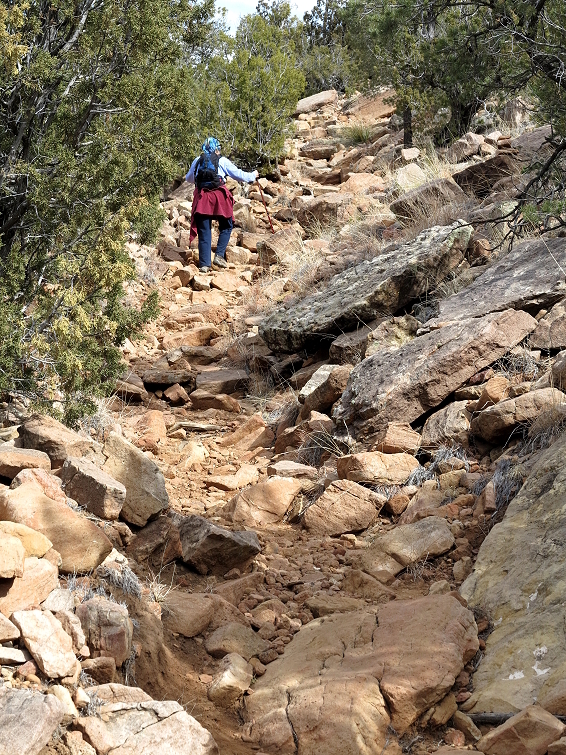 This time we are hiking up the El Cerro Trail, which takes us to the top of the mesa to the west. 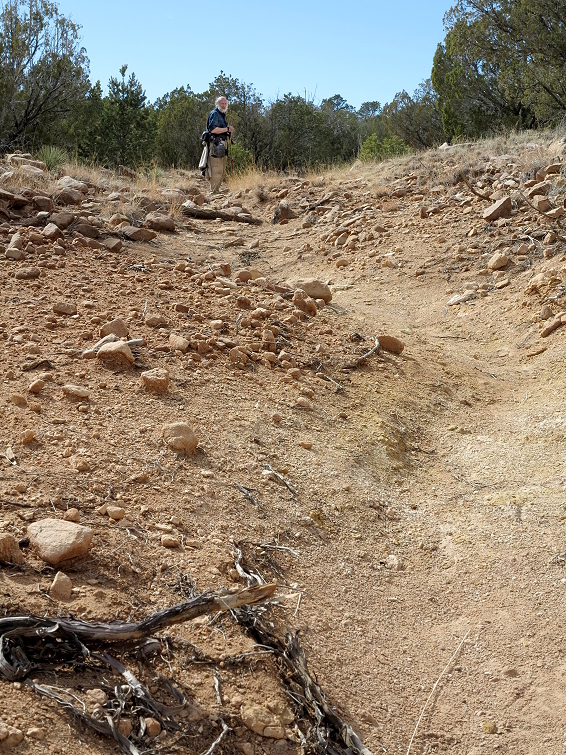 This is the first time we’ve been on this trail. 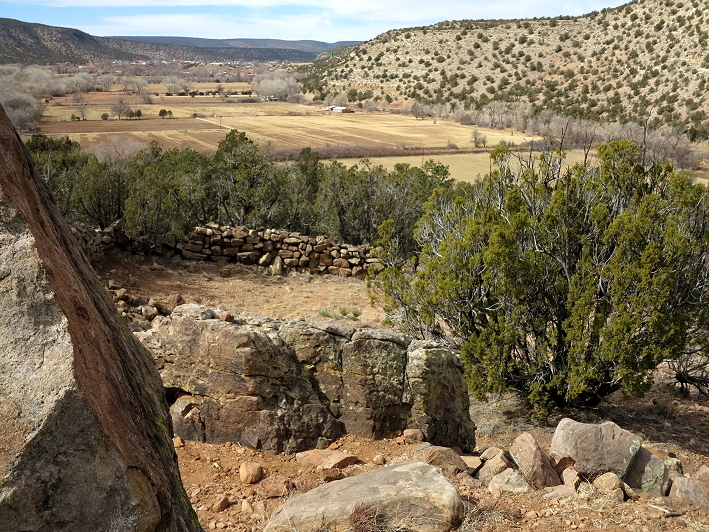 Quite a different view and a really cool rocky outcropping where we hang out for awhile. 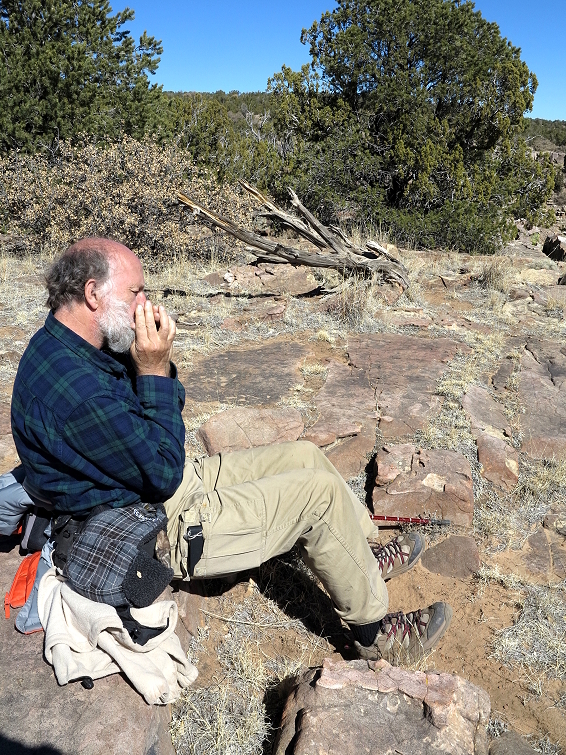 Clifford plays his harmonica while I take photos, loving the beautiful blue skies this morning. Back at camp, we have lunch and all too soon it is time to pack up and head home.